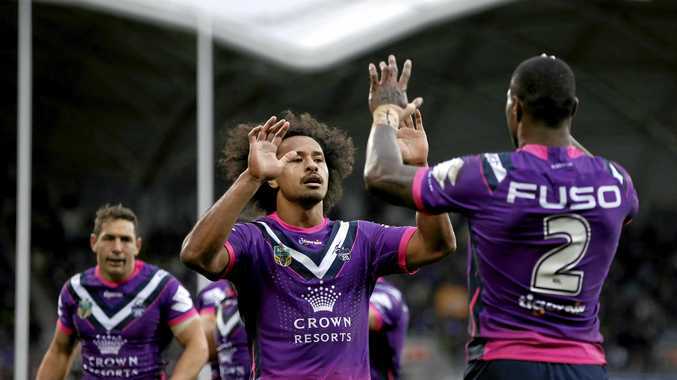 LEAGUE: Bundaberg's Felise Kaufusi might be focused on delivering a second straight title for the Melbourne Storm but he will always have time for his brother. The former Past Brothers junior for one day only will become a Tiger to help cheer Antonio on to the Bundaberg Rugby League A-grade title. At this stage time won't allow him to travel to Bundy to watch him play with Felise to plays tonight against the South Sydney Rabbitohs. But he will be eagerly looking at the scores to cheer his brother home. Antonio will play in his first A-grade final after missing out early in his career and in 2016 with injury when the side made it. "I actually haven't spoken to him,” Felise told the NewsMail. "But I wish him all the best as he prepares for the final. It could be a couple of big weeks for the Kaufusi family. Felise and Antonio are in contention for grand final wins with the Melbourne Storm and The Waves Tigers respectively with their brother Patrick also in contention for a title. The Storm contracted player is currently trying to win the Intrust Super Cup with Easts and played in last week's win against the Northern Pride. Patrick will be in action tomorrow for the club when they take on Ipswich for a spot in the preliminary final at Suzuki Stadium. Patrick's game starts at 1pm and will be shown on Channel Nine with Felise's match against the Rabbitohs to be also shown on the same station and Fox League at 7.40pm. There is more on Antonio and his quest for a title below.